The Victorian Trades Hall Council grew from the historic winning of the eight-hour day by the Melbourne building trades in 1856. In that year a Trades Hall Committee was formed to receive a grant of land on which the world's first Trades Hall, or "Workers' Parliament", was built in 1859. Initially the Trades Hall's industrial role was limited, but a resurgence of industrial activity in the 1880s resulted in it collecting evidence for the Shops and Factories Royal Commission and taking control of major strikes. 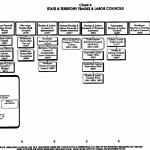 In 1884 the committee became a Council to better reflect this expanding industrial role. The title Victorian Trades Hall Council was eventually adopted in 1970.